How to add sidespin in table tennis serve? Legal serve vs illegal table tennis serve? Table tennis serve is very important, and is the first shot in table tennis that you should learn. I will explain the best way to serve and how to serve short with side spin in table tennis. Coach Xiao Zhan, the personal coach of Zhang Jike, is considered one of the best coach about technical aspects in China. He has helped Zhang Jike to incorporate the reverse pendulum serve in his backhand quick attack playing style. 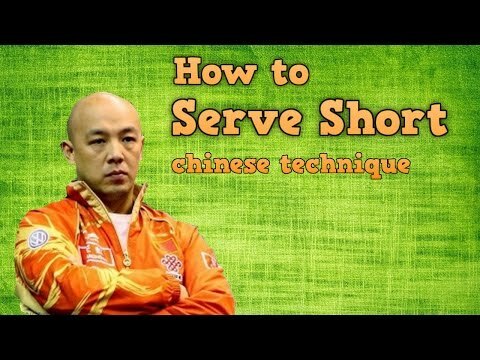 Today, I will talk about “how to do a good table tennis serve in table tennis according to the Chinese coaching philosophy”. In general, players are taught to how to do the heavy underspin serve, but they don’t understand the purpose of this serve. This is not good. You need to understand why you do this serve, and prepare to attack the next shots! That’s why it’s called as “set-up serve” in table tennis. contact the ball as low as possible (lower or at the net height). make the first bounce very close to the net, so the second bounce on the opponent’s side is also short and near the net too. But, this service is short but with less spin, therefore less dangerous. It’s easier to return the short serve without spin than the serve with a lot of spins. You can drop short this service and control the placement of your return. So, the amateur players are taught to serve short first, but then don’t know how to add spin efficiently. In China, the approach is a little different. They teach the player to make a spinny serve first and then ask them to shorten the serve. There is also a good “tricky table tennis serve”! It’s called as “Ghost serve”! a good short serve must have a high variation of spin. Because spin will make the service more deceptive. a good short serve will stop the opponent to attack your service. However, they should not return it easily. (they can’t drop shot and can’t return your service to anywhere on the table as they want). and finally, after your short serve, you must attack first. To do that, the server should find a way to add “energy” to the short service so the returned ball is long and you can attack it. Chinese players rarely use a short serve without spin. They are taught to serve short but spinny. The best way to serve short and spinny is “adding sidespin” to the ball. There are 2 reasons, you should do that. There are 3 types of spin in table tennis serves: backspin (also called underspin), sidespin, and topspin. First reason, because add sidespin is the safest way to add “Energy” to your service. Short serve with backspin, the second bounce on the opponent side, the ball will bounce up and can be attacked. So it’s rather risky. Short table tennis serve with topspin, the second bounce on the opponent table, the ball will jump forward outside the table. So it’s difficult to keep the service with topspin short. If your service is long, the opponent will attack first. Topspin makes the serve go long! Short serve with sidespin. Side spin affects little the trajectory of the ball. Therefore, you can add much spin to your service and keep it short. All the energy is transferred to the spin with less effect on the bouncing. With sidespin, you can add much spin, and keep your serve short! It’s difficult to drop short the ball with sidespin. If the opponent pushes this ball, the returned ball will be long and you can attack it first. If the opponent flips the ball, he must counter the direction of the spin so you can predict the placement of the returned ball. Second reason. Sidespin is the way you control the placement of the next ball. The placement of the ball is very important, which will affect your 3rd ball attack and also your playing style. There are 2 types of sidespin: clockwise rotation which is called as pendulum serve, and anti-clockwise rotation (called as reversed pendulum serve). Sidespin also help you control the placement of the return! Main advantage of sidespin in table tennis. Because you must counter the direction of the spin in table tennis if you make the pendulum serve (the ball spin to your right), the returned ball will go to your left. This type of sidespin is preferred by the Forehand dominant player like Ma Long. The best-attacking shot of the Forehand dominant players is the pivot, where they attack at his left side. Ma Long uses this type of sidespin because he wants that the ball returned to his left side. If you are the Backhand dominant player like Zhang Jike. You prefer using your Backhand at a larger area on the table: your left side, also in front of your body, and a little bit at your right side. You want that the opponent returns the ball more to your right side. That’s why Zhang Jike prefers using the Reverse Pendulum serve: the ball spins to his left so the returned ball will go to the position he is waiting for. Zhang Jikes serve: Reverse Pendulum Serve. So please remember, side-spin will make difficult for the opponent to return your service. The ball with sidespin is deceptive and prevents the opponent from returning it shortly. Sidespin is also the way you control the placement of the returned ball. The placement of the returned ball is the opposite of the spin direction and can be predicted. My answer is: “No! Don’t do illegal serve, and you should prepare yourself to deal with dirty, tricky serve”. Here you are! That’s it for today. See you next weekend, EmRatThich. Watch the next tutorial here: How to loop kill the ball in table tennis? You should also master the most important basic skills in table tennis. And learn how to choose the best equipment that fits your playing style! you are the best coach. thank you for your free course. I think that you are one of the best coaches around today. Always up to date with the latest techniques and playing styles, your site should be required reading for all new players. Far better than most other coaches in my opinion.